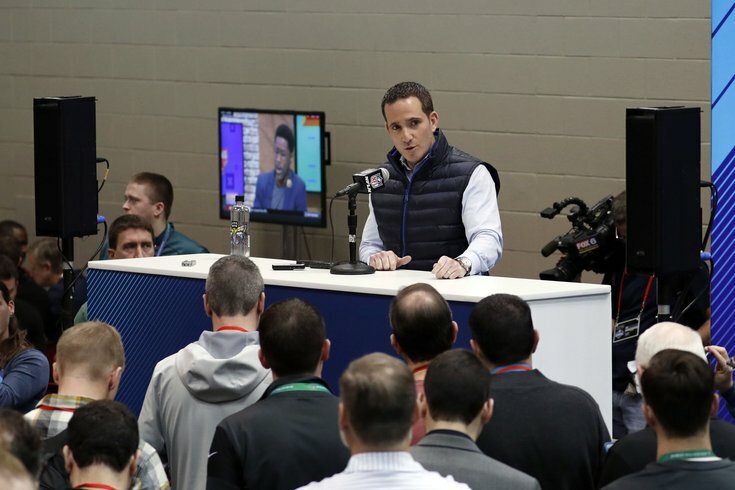 Howie Roseman speaks, as an extremely handsome man in a grey jacket with a hoodie listens. The Philadelphia Eagles don't have much in the way of glaring needs heading into this offseason, as their stacked roster was able to weather the losses of Carson Wentz, Jason Peters, Jordan Hicks, and Darren Sproles, and still go on to win a Super Bowl. As such, they can head into the 2018 NFL Draft with something of an open mind of who they'll take in the first round, and beyond. On Wednesday at the NFL Combine, Howie Roseman and Doug Pederson spoke about the positions of strength in the draft. "I think from our perspective you look at the running backs, great class of running backs here," Roseman said. "I’m really excited to see those guys work out. Maybe when you look at the tight end class, it’s a little deeper. It’s maybe a little lighter along the defensive line than it’s been in the past couple years. The offensive line took a jump this year. And then the safety class is really strong." Doug Pederson agreed with Roseman on the running backs and tight ends. "I think this is another good running back group again," he said. "The tight end group, offensively, and the linebacker group. It’s not a big group there (at linebacker), but there are some guys at the top of the group that could be intriguing to see if they fit." The Eagles could certainly be interested in many of those positions, as we noted when we took a look at the Eagles' five biggest team needs a few weeks ago. The only two running backs who are certain to be on the Eagles' 2018 roster are Jay Ajayi and Corey Clement. Ajayi cannot be considered a lock to be on the roster in 2019, when he will be a free agent. The Eagles could certainly bring LeGarrette Blount back, but likely only at a low cost. To be determined if he'll find a more money elsewhere. Adding a running back to the mix in the draft is a reasonable possibility. The Eagles are set with Zach Ertz as a starter at tight end for the foreseeable future, but their excess of depth is likely to erode this offseason. Brent Celek's body has taken a pounding over 11 years with the Eagles. Now that he has a ring, there's a thinking that he will retire. Meanwhile, Trey Burton is set to become a free agent and may make starter money on the open market. The Eagles aren't going to be able to afford to match that, if so. With Burton and Celek both potentially no longer on the roster, the Eagles will need to fortify that position, ideally with at least one guy who can block well. I can't see many scenarios where the Eagles draft an interior offensive linemen, early in the draft anyway. I'm not sure where you could even fit one on the roster. An offensive tackle, however, would make sense. Gun to his head, Doug Pederson thinks Jason Peters will be his starting left tackle next season. Prior to the 2017 season, we noted that you have to go all the way back to 2001 to find a player older than Peters who started at least 10 games at left tackle in a season. That would be Lomas Brown, who started at LT for the Giants at the age of 38. And now Peters is another year older. Still, if there's a freak of nature who can come back after a torn ACL at the age of 36, it's JP. Peters aside, the Eagles have to like what they saw from Halapoulivaati Vaitai in the playoffs, who more than held his own. After a rough start to his career, Big V has slowly but surely gotten better. My guess is that there are differing opinions on the second floor of the NovaCare Complex on whether or not Vaitai should be viewed as a long-term starter. Either way, the Eagles need to add to their offensive tackle pipeline. When the Dallas Cowboys lost Tyron Smith for a couple games, their offense completely fell apart. Credit crappy depth, as well as crappy adjustments by their coaching still, but it remains a lesson learned on the importance of depth at that position. The Eagles got good play out of Nigel Bradham and Mychal Kendricks this season after losing Jordan Hicks to a ruptured Achilles. Bradham is a free agent, Kendricks is making a lot of money, and Hicks may not immediately be the same player he was, pre-injury. He'll also be in the final year of his deal in 2018. No matter how it all shakes out with those three linebackers, the Eagles need to add depth at the position, which was exposed at times last season. Malcolm Jenkins and Rodney McLeod are a very good safety tandem. In 2017, Corey Graham played an underrated role as a third safety. He'll be a free agent this offseason. The Eagles could be looking to add some youth and depth at the position if Graham leaves for another team.